On June 30, 2009 (tomorrow) Microsoft has decided to put an end to MSN Web Messenger. MSN Web Messenger service launched back service 5 years ago, and was an alternative for those who didn't want to, or weren’t able to use the downloadable Windows Live Messenger client. The replacement is the Messenger service that is integrated into Windows Live Hotmail. With the web-based integration of instant messaging client right from the Windows Live People page in Hotmail, you can now chat right from Hotmail. Here is the statement from a Microsoft spokesperson : "We made the decision to retire MSN Web Messenger as part of our overall investment in updating and re-aligning our online services under the Windows Live brand. We apologize for any inconvenience that this may cause our customers." 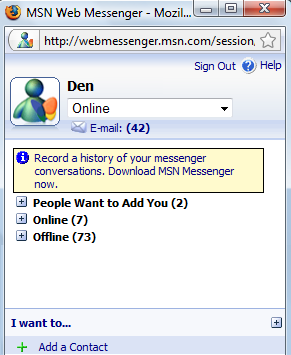 MSN Web Messenger will be officially retired on June 30, 2009 (this Tuesday). If you want to access Windows Lİve Messenger on the web you'll need to use the new Hotmail (or Live profile) option, or use a web based client."